Experienced, thorough, and dependable, Arango Insulation is the perfect solution if you’re looking for an insulation installer you can trust. Family owned and operated, we offer the personal customer service of a small company with the technology and ca pabilities of the biggest. Our highly trained technicians have worked in almost every environment, from blow insulation for a single-family Florida home to fiberglass batts for an entire housing development outside Richmond. Offering exceptionally fast turnaround times, we can often have our insulation installers on the job site the next day, and we’re able to quickly complete the job without sacrificing quality. In fact, most of our commercial orders are completed one to three days after they are called in. Virtually any other structure – if you build it, we can insulate it. 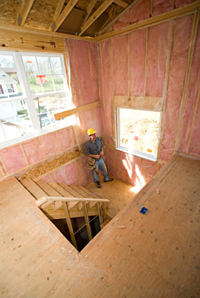 When your clients demand the best, call Arango Insulation. For more information on the benefits of having us as your commercial insulation installer, or for a free estimate, contact us today. We also perform commercial roofing services.